This chapter provides a general overview of how to run reports in XpertMart™ and how to add or replace pre-designed reports. The content of specific reports is discussed in other chapters throughout the User Guide. Designing new reports in another topic that is beyond the scope of this chapter. 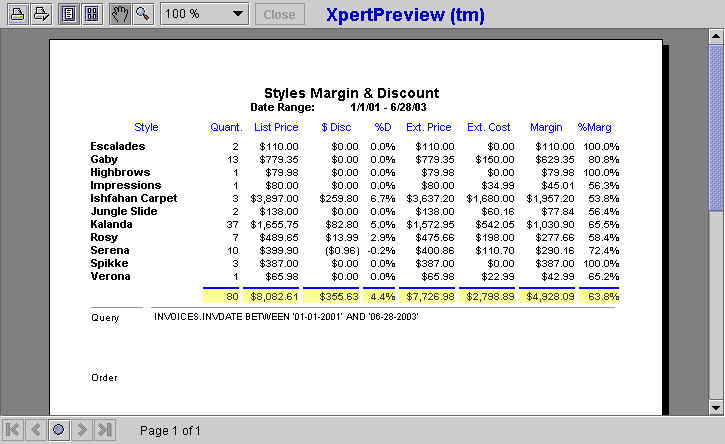 Contact your XpertMart™ Authorized Dealer for more details on designing new reports. 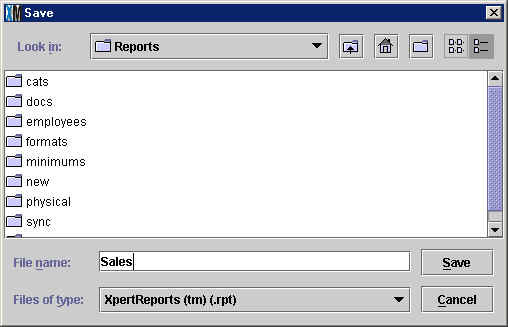 There are two main ways to lanch reports in XpertMart™: using the Reports Button in the toolbar of any catalog, from the Reports Menu found in the Main Menu (shown below). You can also run reports that are specific to certain processes such as Physical Inventory, Minimums & Maximums and Synchronization. These reports are found under the menus of their respective processes. When you use one of these methods, the XpertReportRunner™ will open up with a menu of possible reports to run. You can also run reports directly from the Report Designer. When you use the Reports Button of a catalog, only reports pertaining to the specific catalog you were in will appear in the XpertReportRunner™ window. For example, if you are in the Brands Catalog, only reports about brands will appear in the window, and so on. The Reports Menu, on the other hand, offers greater variety. Reports are grouped in three ways. The Reports>Catalog Reports Menu lets you open reports for the Styles, Items, Stock and Audit catalogs just as if you were using the Reports Button in any one of these catalogs. 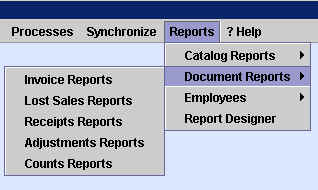 The Reports>Documents Reports Menu groups reports by document or transaction type. Invoice Reports contains all reports pertaining to sales; Lost Sales Reports to lost sales; Receipts Reports to purchasing and receiving; Adjustments Reports to adjustments to inventory and cost adjustments; and Counts Reports to counts and physical inventory. 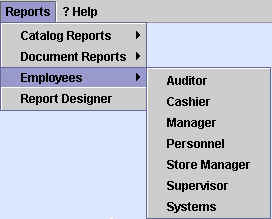 The Reports>Employees Menu groups reports by store employee or retail function. The Auditor Menu contains all reports related to audits and cost audits; the Cashier Menu has all of the end-of-day POS reports; the Manager has all of the chain-level and company-wide trend reports; the Personnel Menu has all of the employee and commissions reports; the Store Manager Menu has all of the store-specific sales and inventory reports; the Supervisor Menu combines some of the Auditor and Cashier reports; and, finally, the Systems Menu has reports related to the Synchronization process. 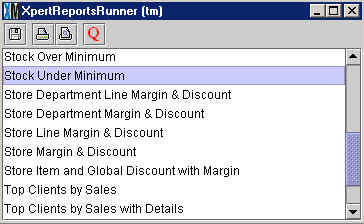 XpertReportsRunner™ displays a list of reports available for you to view on screen or print-out. The contents of the XpertMart™ depend on how it was launched but generally display all of the reports of one catalog, of a transaction type or of a employee/store function. Query: Pressing this button opens the XpertQuery™ screen allowing you to modify the select and order clauses that are underlying the query behind the report. Use this button if you want to filter the information in the report (perhaps to only view certain styles or departments) or to change the order in which the information is displayed. To learn more about the select and order clauses, see the XpertQuery™ topic. Preview: Pressing this button lets you preview the report using the XpertPreview™ tool (explained below) before actually printing the report. Print: Pressing this button prints the report using the default printer you've setup in your operating system. Save: Pressing this button allows you to save the report in a different directory or using a different name. This option is particularly useful when you've made changes to the Query behind the report (see above) and want to save the changes. Note: what you are saving is the design of the report (i.e. the kind of information to pull from the database and how to display that information) and not the data in the report itself. For example, you may modify the query of a sales report so that it filters out certain stores. If you pressed Save, you would save this selection criteria but you would not save the actual sales figures for the parameter (e.g. date range) you've chosen. However, there is no real need for you to save the data as the data is always residing on your database. At any time you can rerun the report using the same parameters. 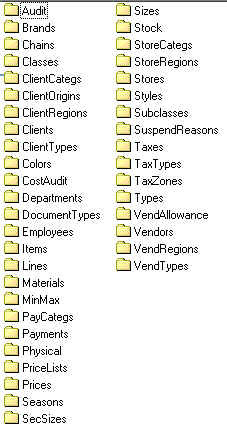 When you press Save, you will see a screen (shown below) displaying the subdirectories of the "Reports" folder in C:/Main. You are free to save the report in any one of these folders. To learn more about the structure of the Reports directory, see the Where Reports Are Stored section below. For many reports, when you press the Preview button to preview the report, XpertMart™ will first ask you to insert a parameter value for the report. Parameters are used to filter out unwanted information and focus the report. Parameters, therefore, make your reports incredibly flexible as you can use the same report to show different information each time. 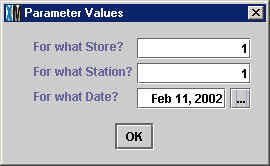 Date Parameter: Asks you to specify the date range for the report. The date range can either be a fixed set of dates or a dynamic (i.e. relative) range. Click on the browse button to open the XpertDate™ tool and select the dates you want for the report. Using this parameter you can run a report such as the Best-Selling Styles report for May 1 - May15th, or for the entire year of 2001 or the month to date, and so on. POS Parameters: Asks you to enter parameters to define a store, stations and date for Point of Sale reports. If you want to run the Payments Journal report showing how you were paid or the Merchandise Journal report showing what was sold, you will need to enter the Store Number (open the Stores Catalog to find the Store Number if you are not sure); the Station Number (usually 1 unless there are multiple workstations setup in the store; see the Configure>Station Configure>Station Info menu to find your station number); and the date you want to run the report for. Item Number/Customer Number: Asks you to specify an item by Item Number or a customer by Client Number. You'll find this parameter used in reports that are specific to an item (such as the Audit Log for a Certain Item report) or specific to a customer (such as the Sales by Client Number report). Print: Prints the report using the default printer you've setup in your operating system. Page Setup: Opens a configuration window that lets you choose page properties such as size, margins and orientation. The particulars of the configuration window will depend on the operating system you are using. See One Page: Lets you preview the report one page at a time. Use the navigation buttons at the bottom of the screen to move to the desired page. See Many Pages: Lets you view 2, 4 or more pages at once on screen, depending on the size of the pages. Drag: Lets you move the page up and down the screen by clicking the mouse button and holding it down. Zoom: Increase or decreases the size of the page on screen. Increase (zoom in) by clicking the left button of the mouse and decrease (zoom out) by clicking the right button. Screen Size: This drop-down menu lets you choose the size of the page on screen. Close: Closes the XpertPreview™ screen. First Page: Takes you to the first page of a multi-page report. Previous Page: Takes you to the previous consecutive page of a multi-page report. Go To Page: Opens a Parameter Value screen asking you for a page number. Takes you to the specified page number in a multi-page report. Next Page: Takes you to the next consecutive page of a multi-page report. Last Page: Takes you to the last page of a multi-page report. It is important that you have a basic understanding of where XpertMart™ stores all of the reports in the event that you need to replace one or wish to add a new one. Every single catalog in XpertMart™ is represented by one of these folder. When you are in the Brands Catalog and you press the Reports Button and the XpertReportsRunner™ screen opens up with a menu of reports to run, what you are in fact seeing is the contents of the C:/Main/Reports/cats/brands folder. Notice that all reports in XpertMart™ have a .rpt extension after their name. 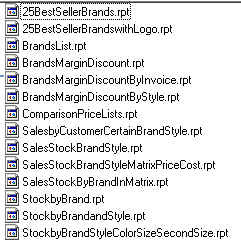 The "Sales by Customer of a Certain Brand & Style" report is the SalesbyCustomerCertainBrand.rpt file. Now you know that if you want to add a report to the Cashier Reports Menu you would be pasting the relevant .rpt file into the C:/Main/Reports/employees/cashier directory. If you need to modify the "Sales Journal" report you would look for a file called SalesJournal.rpt in the C:/Main/Reports/docs/invoices directory.